In the picture above is one of our color chess piece. This presented to you a blue King piece. We have a lot of color chess piece in variety colors. Not only King piece, but we have the Queen, Bishop and another chess piece. The blue describe about calm nuance that match for any occasions. 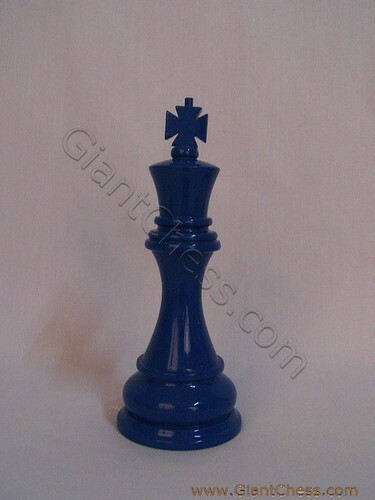 So that, we make you a blue King for your house decoration. You can put it in your living room or library room. The chess pieces has carved by our expert craftsman. It has made from best Teak wood and polished well in attractive color. Because of made from the strongest wood, so you can use it for outdoor need. You may decor your garden, backyard, camp, patio, etc; using this kind of chess. Very durable for indoor and outdoor use in any seasons. Get it now! Sure that your children love it.